If you ever thought the world of flash storage was, well, a little pedestrian, then you've clearly never met Kingmax. The memory-maker likes to spice things up with world firsts, and exhibits an enthusiasm for the utilitarian product that can only be admired. The latest innovation? 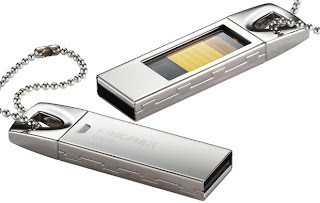 A USB Flash Drive with a glass ceiling. The UI-05, as it is known, lets you peer directly at the chip that holds your data, while keeping it waterproof and dust-proof, all in 8, 16 and 32GB denominations. Even better for you, that enthusiasm is backed up by pure faith, with the metal-cased pen drive easing nerves with a (not world first) five-year warranty. What Kingmax didn't let us see, however, was price and availability. There's a close-up shot right after the break, or you can jump to the source for more info.